Thang Long Puppet Theatre is a famous cultural place for domestic and foreign tourists. It is situated on Dinh Tien Hoang street and nearby many other attractions in Hanoi as Hoan Kiem Lake & Ngoc Son Temple, Hanoi Old Quarter, Ly Thai To Park, Hanoi Opera House, etc. 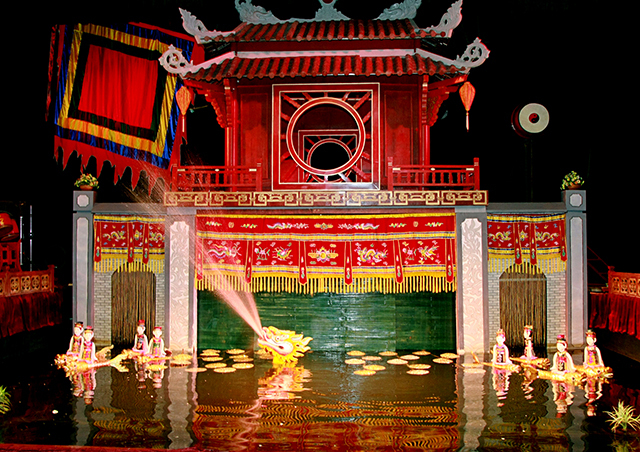 It provides the water puppet show which is unique Vietnam traditional art. The Theatre was established on October 1969 and now become the leading brand name of Vietnamese water puppetry. The Theatre has of preservation, maintenance and development of the traditional water puppetry; confirm-reinforce its brand name; contribute significant part to the advertisement and speed up the cultural and art exchange and cooperation in the world. There are often 5-7 shows every day to satisfy with demands of audiences. This tradition is unique to North Vietnam but has recently found fame on stages all over the world; so it’s a rare treat to see the puppets perform in their original location at the Thang Long Water Puppet Theatre. Performances are accompanied by a Vietnamese orchestra playing traditional music using drums, wooden bells, horns, bamboo flutes and cymbals. There are also authentic Vietnamese operatic songs telling the story that is being acted out by the puppets. Most of the shows recount Vietnamese folk tales and legends with topics including the celebration of the rice harvest depicted in a humorous fashion. 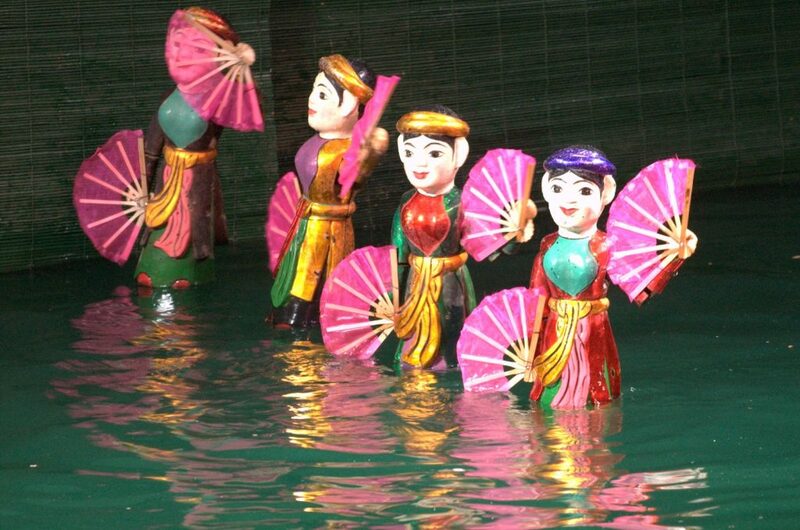 The main content of water puppet show is about daily life of Vietnamese farmers (cultivating, tending buffalo, catching fishes…), communal entertainment (swimming contest, dragon dancing…), or historical legends (Le Loi returns precious sword…). Performances are accompanied by a Vietnamese orchestra playing traditional music using drums, wooden bells, horns, bamboo flutes and cymbals. There are also authentic Vietnamese operatic songs telling the story that is being acted out by the puppets. And the main music used in the water puppetry performance is music of Cheo which is the specific traditional art in the Northern plain. 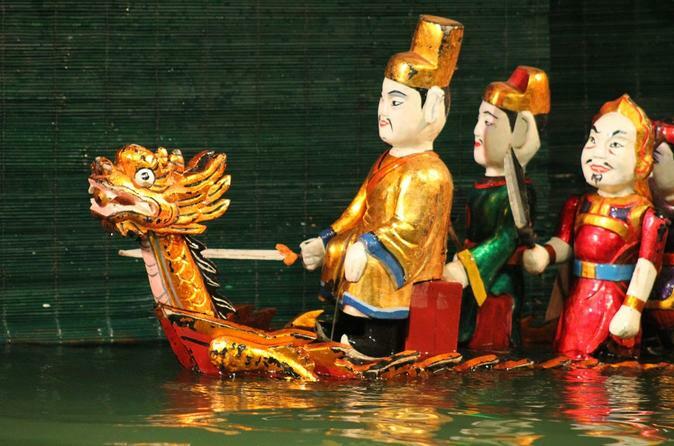 Thang Long Water Puppet Theatre is one of the most popular tourist attractions in Hanoi with tickets selling out well in advance so it’s worth booking yours as soon as you arrive in town. It is also advisable to pay more to get closer to the action as the theatre seats a few hundred people and the puppets are not that big.